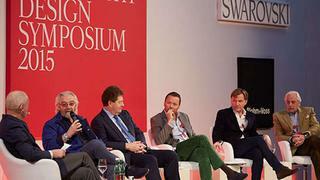 The world’s top yacht designers, builders and superyacht owners left the water behind and headed to the mountains of Austria for the Superyacht Design Symposium 2015 where exciting debate on all things yacht design ensued. Here are some of the top takeaways. 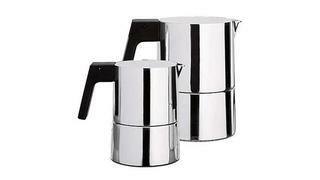 Designing with the material is not as clear-cut as it might seem. While some builders and designers are embracing glass others see its prevalence as a gimmick. A concept for a glass bottom superyacht specifically had the crowd split. But speaking in support of the use of glass, Feadship’s Ronno Schouten explained that since the yard’s Glass Research program was founded in 2006, the Dutch builder is using more glass than ever before. Feadship has had great success with its glass-centric yacht designs, namely the ultra-secret Venus, built for Steve Jobs, and the highly innovative Como, which swept the ShowBoats Design Awards. Peder Eidsgaard goes on to back up Terence Disdale’s theory by stating what most already suspected – there isn’t such thing as a no-compromise yacht. 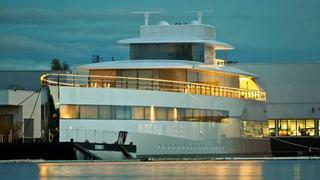 “Owners ask if there is a no compromise yacht, but there is no such thing,” he says. “If we make a compromise on the exterior, we know it will lead onto the interior. “We are all designers with different backgrounds and different working methods doing much the same thing basically, trying to figure out, as Terry said, how much you can fit into the suitcase, how to best organise, and it all goes back to the brief,” says Peder Eidsgaard. 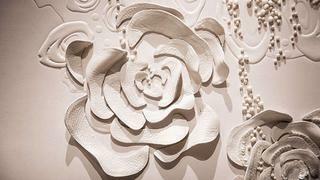 Some art collections on board yachts are so grand they outweigh the value of the yacht itself, often many times over. 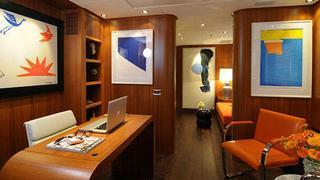 Which is why it is so important to consider these five things when displaying fine art on superyachts. 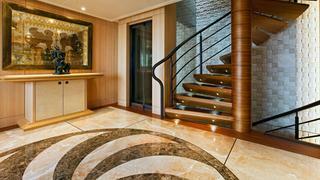 Tina Green designed 58 metre Benetti Illusion V, which made its debut at the Monaco Yacht Show 2014. Amidst travertine walls, coconut furniture and a stingray staircase feature are a garden of roses in her detailed bespoke design. It is this single flower that inspired the entire yacht’s style, in fact, as designer Tina Green revealed on the stage of the Superyacht Design Symposium 2015. It took a relative outsider in famed architect Piero Lissoni to hold up a mirror to the superyacht industry. Piero Lissoni asked some of the hardest hitting questions, and wondered aloud if the yachting industry is keeping up with the times. “It’s a high-tech industry, use the best design in the world, the best technology, best money, but at the same time, completely disconnected with modernity,” Pieori Lissoni said to the crowd of superyacht designers, builders and owners. Piero Lissoni also questioned why designers would create something that conflicted strongly with their own personal aesthetic, “If I don’t like the a taste of my client, I will never take on the work,” he said. Superyacht designers were up for the challenge and the feedback. “Input from other worlds is so interesting, it’s always good to have someone else’s opinion,” says Mario Pedol of Nauta Yachts, designer of the world’s largest yacht Azzam. The regulation debate also showed up in a workshop on platforms where the merits of Passenger Yacht Code were questioned. Audience members wondered, is getting a few more guest accommodations worth the bother of the extra red tape? Want proof that superyacht design is ever evolving? Just look at staircases, says Andrew Winch. “Used to never have comfortable staircases, now the length of tread has changed,” says Andrew Winch, who discussed designing yachts based on ergonomics. Andrew Winch is lauded as rethinking superyacht stairways and foyer design as far back as two decades ago, when staircases were seen as little more than ways to connect decks. Designers will tell you that inspiration comes from everywhere, but how about a new pair of shoes? While prepping for their photo shoot, legendary designers Espen Øino, Remi Tessier, Terence Disdale and Andrew Winch take a peek at Tim Heywood’s new shoes. Pictured, Terence Disdale reaches to pull up Tim Heywood’s trouser leg so the designers can take a closer look at the new kicks.